Fundraising Idea : Bubble Ball Footie Tournament - Klubfunder - Helping clubs raise funds. 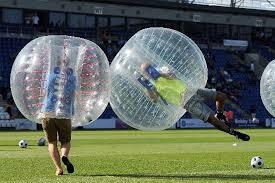 The latest craze sweeping the Ireland and the UK, a mixture of zorbs and five-aside football. Its different and its fun. Why not run a five-aside bubble ball tournament as part of your fundraiser. You can raise funds by charging an entry fee per player and also asking each team entered to reach a fundraising target. The winning team can be given a prize, though bragging rights alone should be incentive enough. Why not run the event across the rest of the clubs in your league to add some local rivalry? Just like football, bubble football is played on a grass pitch of regulation size, with goalies and a referee. Often, time is kept according to regulation play, or games are simply ended when everyone has run and bounced themselves to exhaustion, or when everyone is laughing too hard to play anymore.